Labour unions originated in Colombia in the 1920s when workers started to be involved in activities different from agriculture. During the 1930s thanks to the Liberal Party support, the organized labour movement was consolidated. However in 1945 the liberal government was defeated giving rise to a decade of partisan struggle and labour unions repression. Labour unions lost the political weight they have gained with the Liberal governments. From then on labour unions influence in economic policy has been limited. 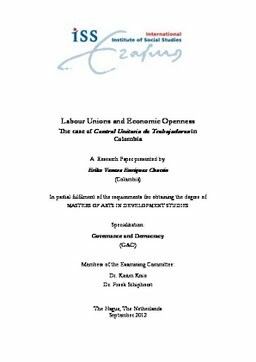 In this paper is analyzed how the labour movement shaped and was shaped by the larges economic policy shift of the last decades: the economic openness, that took place during the late 1980s and early 1990s in Colombia. Relevance to Development Studies Worker’s organization has been recognized throughout the world as a basic right. In Colombia the international labour law was introduced in the 1991 Constitution, still in force nowadays, in which was recognized the right to work. Colombia also ratified in 1976 the conventions N°87 and N°98 of the International Labour Organization (ILO), the first one about freedom of association and protection of the right to organise and the second one about right to organize and collective bargaining. Yet, unions in Colombia have faced major challenges. The unionization rate which reached its highest point in the 1960s around 13% has felt to 4,2% in 2010. Moreover, according to the Human Rights Watch 2012 World Report, in Colombia the number of trade unionist killed every year remains higher than in any other country in the world, in 2010 51 unionist were murdered according to the National Labour School (ENS, for its acronym in Spanish)(Human Rights Watch 2012:232). This paper aims to contribute with new insights to the study of the organized labour movement in Colombia, by making a historical analysis to understand the particular processes that have shaped labour unions and the way in which they relate to other actors in society. The explanation given here seeks to go beyond the ones that lack rigour in understanding the particular context in which this movement has evolved. The approach used here can be replied in other case studies.